Back in 2007, when we were organizing our wedding, I suggested to my husband, in all seriousness, that we walk down the aisle to El Ten Eleven’s “Sorry About Your Irony.” He vetoed my proposal. The traditional Episcopal church where we got married probably wouldn’t have gone for it either; I doubt its old speakers had ever heard the likes of post-rock. The song title, too, was perhaps a little foreboding; regret and irony aren’t conditions (if that’s the right word) one typically wants to associate with a wedding. I had also wanted our first dance — a tradition I had no desire to honor, but was forced to uphold — to be to Red House Painters’ “Song for a Blue Guitar,” which is an absolutely beautiful song. If only the first line out of Mark Kozelek’s mouth weren’t “When everything we felt failed….” (What can I say: I have a knack for choosing mood music.) We opted instead for Fauré at the church and Band of Horses for the dance. 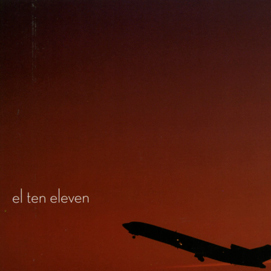 But El Ten Eleven remains for me a wonderful maker of soundtracks for sunny-day urban perambulations — for noticing cracks in sidewalks, reflections in shopfront windows, recognizable shapes in the clouds overhead. Perhaps it’s the sometimes math-rocky feel of the music that inspires careful attention to rhythm and texture, that evokes geometric precision.The band’s name is derived from the Lockheed Martin L-1011 TriStar; perhaps appropriately, this is music for cheery engineers of everyday life. Dave and I saw Gary’s most recent film, Urbanized, last night as part of Urban Design Week. Here the soundtrack felt not only fitting, but almost natural — as if it was an indexical manifestation of the urban rhythms on the screen. The music seemed, to borrow one of the band’s song titles, like an urban “Central Nervous Piston” (see video below) — a simultaneously organic and mechanical index of, and power-source for, urban circulation. 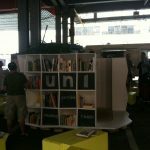 In Urbanized, the soundtrack that has undergirded so many of my walks across the Manhattan Bridge, up the Bowery, across 14th Street, is now exported to the streets of so many other cities across the globe, proving that post-electro-math rock is indeed, as we’ve always suspected, the universal spatio-rhythmic language. ….If only!